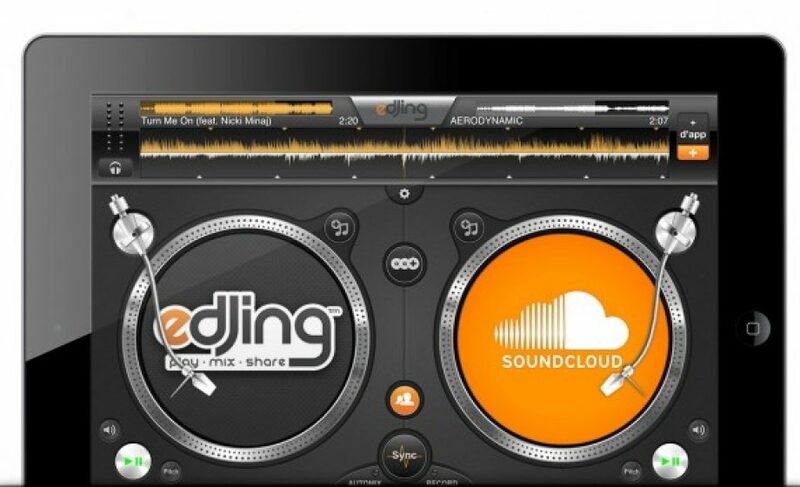 edjing, the mobile app which allows you to mix music on iPad and iPhone, has announced that it has integrated with Soundcloud, allowing all users to access SoundCloud’s catalog of music to play and mix. The service previously allowed users to connect to their Deezer Premium account ( a free account would only allow samples to be played), connecting to over 15 million songs; however, this new free access solution will open up the service to a whole new category of users. With over 3.5 Million downlads to date, the edjing app has easily become a staple application for iPad and iPhone. When I met the founders earlier this year at LeMobile, where they won the award for Best Mobile App, the founders told me that the goal of the app has always been to enable DJs to leave their records and turntables at home, and DJ from their iPad or iPhone. The service has plenty of features (and in-app buy ins) to all users to loop, augment, and mix music, and it certainly caught my attention when I first saw the app at LeWeb Paris last year. In addition, the Soundcloud audience may be a perfect fit for the application. As Soundcloud has historically been heavy in the electronica genre, I see a great fit and a value-add on top of the Soundcloud platform, allowing users to more easily mix their tracks together and share them with their friends.